5.3c Combination Circuit for the Conversion of D.C. Currents and Voltages into A.C.
International Series of Monographs on Semiconductors, Volume 8: Structure and Application of Galvanomagnetic Devices focuses on the composition, reactions, transformations, and applications of galvanomagnetic devices. The book first ponders on basic physical concepts, design and fabrication of galvanomagnetic devices, and properties of galvanomagnetic devices. Discussions focus on changes in electrical properties on irradiation with high-energy particles, magnetoresistor field-plate, Hall generator, preparation of semiconductor films by vacuum deposition, structure of field-plate magnetoresistors, growth of semiconductors from the melt, and galvanomagnetic materials and effects. The text then elaborates on the applications of the Hall effect and the magnetoresistance effect. Topics include contactless control, connecting the field-plate to other semiconductor devices, non-contacting variable resistance and potentiometer, measurement of magnetic fields and quantities proportional to magnetic fields, and measurement of quantities representable by a magnetic induction. The manuscript underscores other possibilities for controlling the electrical properties of semiconductors by means of a magnetic field. 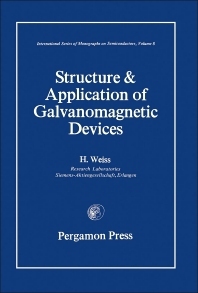 The publication is a vital source of data for researchers wanting to explore the structure and applications of galvanomagnetic devices.